Disclosure: while this is not a sponsored post, and contains no sponsored content, my ticket to BlogFest—just like everyone else’s—was generously paid for by the BlogFest sponsors. I’m thankful for that. As is my editorial policy, all of the opinions and words below are my own. The giveaway prize is sponsored by me–I ate all the yummy snacks in the swag bag, but decided to share some of the ones I picked up during BlogFest–though it includes some of the non-edible cute swag given to bloggers at BlogFest. For the Love of Snacks! Let’s talk about snacks. I love snacks. I would happily trade breakfast and lunch for snacks all day. Sadly, my go-to snacks are not always the healthiest options, or the optimal building blocks for my body and fuel for my workouts. In world of Snickers bars and Twix ads—not to mention a wide selection of junky choices always at arm’s reach—what’s a girl to do? Enter BlogFest. #SnacksForDays should be the official hashtag of BlogFest, because we get fed well! This year, like all others, we had a number of great sponsors in the snacking business to keep us going. 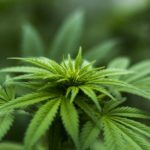 Even though bars—snack bars, granola bars, protein bars, candy bars—is a pretty crowded food category these days, I like to stay on top of what is available. Let’s face it, most of us don’t cook all of our meals every day, and some of us frequently find ourselves in situations where a satisfying snack is not easily at hand. To avoid office vending machines, my solution has been to keep a drawer stocked with lunch-able items (canned soup, Tasty Bite meals, etc.) at my desk. Bars are a key component of this, and no matter how much I love one type of bar, I also get bored easily…and if I’m bored, whatever junk is in the vending machine looks much more appealing than what is in the drawer. But back to Be Better. Be Better is a brand new line (which explains why I’d never heard of it). There are two Be Better products: a flaky protein wafer bar, and protein squares (two per pack). 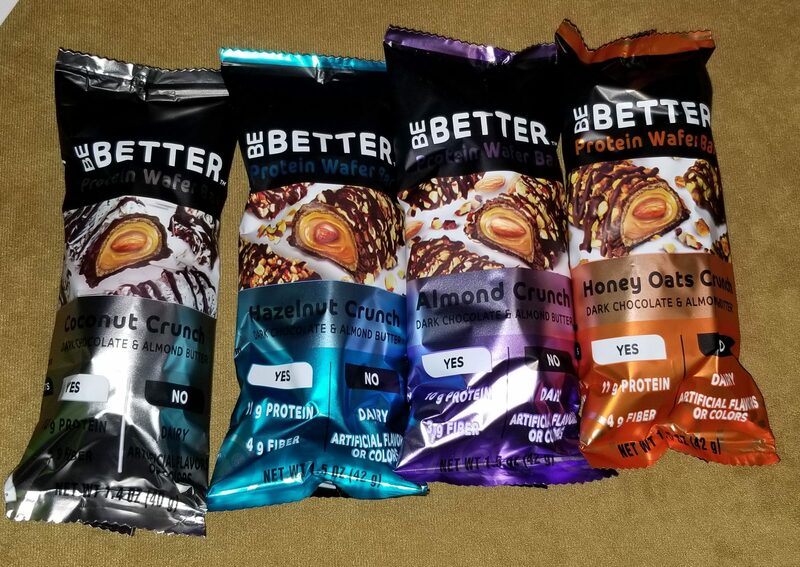 During BlogFest, the Be Better table in our conference room kept a full stock of all of the flavors, and we were able to try them at our leisure. I naturally gravitated towards the coconut flavors, Coconut Trail Mix protein squares, and coconut crunch protein wafer bars. I found the protein bars to be a little bit messier to eat than I had anticipated; due to the flaky layers that give the bars their light and satisfyingly crispy texture, it is possible to eat the bar and wear the bar at the same time. (As someone with zero natural grace, this is how I ate the first bar.) By the time I ate the second bar, I had learned to be a little more delicate in my chomping, which greatly cut down on the resulting mess. By the time I hit the third one, there were just a few crumbs. The protein squares surprised me for two reasons. First, they have chocolate in them and remind me very much of a gourmet type of candy bar. Second, despite my first observation and their delicious flavors, I found that I prefer to eat them one at a time (as opposed to eating both of the squares in the pack). 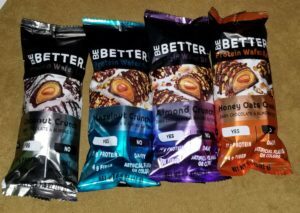 Be Better follows the current bar trend of being higher in both protein and calories than many older snack bars (think of anything from the very misguided 1980’s low-fat era), and I found one bar was the perfect size for a snack that sated my hunger and made me feel like I’d eaten something of substance. The Hazelnut Crunch protein wafer bar has 200 calories, 17 grams of total fat (largely from the nuts), 4 grams of fiber, and 11 grams of protein, for example. The caramel & almonds with dark chocolate protein squares have 150 calories, 9 grams of fat, 2 grams of fiber, and 10 grams of protein PER SQUARE (each pack has two squares). You can learn more on their website, https://www.beingbettermatters.com which is also the only place to buy them right now. (Or at least I checked Amazon and found nothing, and Google didn't return anything.) 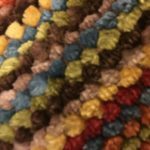 At the time I'm writing this post, there is an offer to get a hat, a sticker, and another sample with your first order if you subscribe to the Be Better mailing list. Psst! 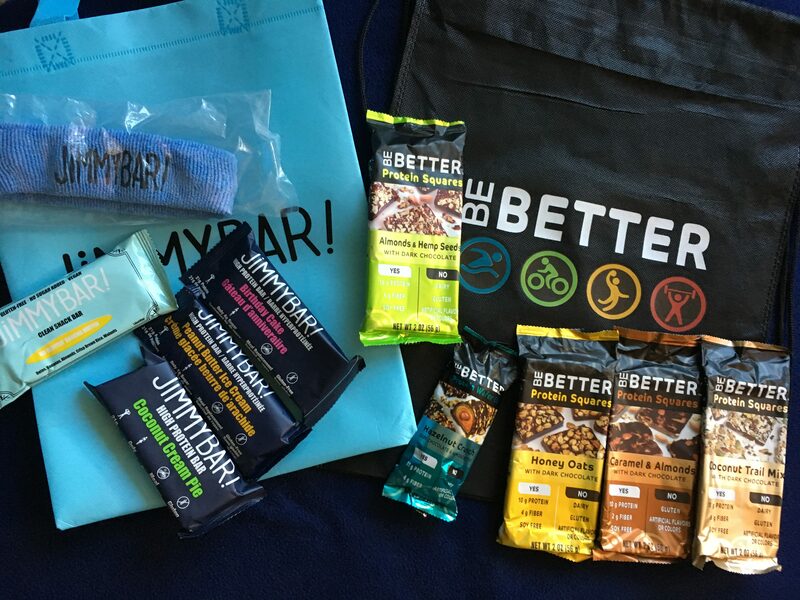 My friend Christine is giving away a WHOLE BOX of Be Better bars! 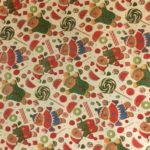 Head over to her blog to enter to win! Jimmy Bar's protein bars also follows the higher calorie, higher protein trend I’m seeing in snack bars now, so one bar is plenty for a snack. For example, the Birthday Cake flavor Jimmy Bar has 260 calories, 11 grams of fat, 29 grams of carbs, and 21 grams of protein. Depending on how your other meals are timed, I could also see eating a bigger breakfast and dinner, and having a Jimmy Bar as a lunch (with a piece of fruit or something, to make sure I get produce in that meal). 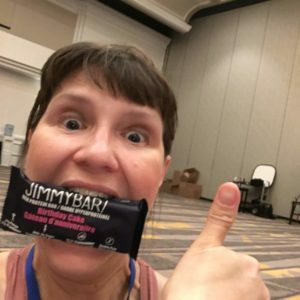 I’m planning to add Jimmy Bar to my running stash as well, because the solid texture of the bar means it will be easy to open and eat while I’m out on a run or at a race. Jimmy Bar makes multiple varieties including some that are vegan, nut-free, and in smaller sizes. 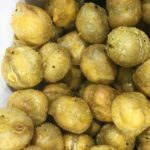 You can learn more about Jimmy Bar at their website. Jimmy Bar has been around since 2013, and is more widely available than Be Better. There is a store locator on the Jimmy Bar website, and you can also buy them on Amazon (that's an affiliate link, but it doesn't cost you anything extra to use it and Jimmy Bars are eligible for Prime, so…). They have a Dog CEO, and currently offer free shipping on orders over $40. Carleeh and Some of the Sweat Pink Squad at the La Croix booth. Photo courtesy of Carleeh. While not present in the BlogFest conference room, La Croix also played a major role in my BlogFest and not just because they sponsored the BlogFest Networking Happy Hour that marked the official end of BlogFest. In addition to being a BlogFest sponsor, La Croix is a staple in my fridge. (Friends, 24 cans at Costco for around $7.) Also, they always have a great booth at the IDEA World Expo, and this year was no exception. The photo booth has been a staple for the past few years, and they supply fun props to use. This year each side of the La Croix booth had a color/flavor theme. In addition to their photo booth (tangerine), they had a set of punching bags and pink boxing gloves on one side (berry), and yoga mats and blocks and foam rollers (lime). Each corner had a big fridge filled with every flavor of La Croix, including the new key lime (which was also included in our swag bags). 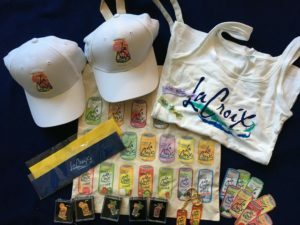 If you've been living under a rock, you can learn more about La Croix on their website, which also has cute pictures of some of their other sampling booth layouts from other events. If you can't find La Croix at a store near you, try Amazon (affiliate link, and some combinations are available on Prime). Unfortunately this year the Expo was not in the same building as most of the IDEA sessions—one reason I hope IDEA does not return to San Diego–it was at the far end of the San Diego Convention Center. Since it took a good 15 minutes to walk from one building to the next, I didn't get to spend as much time in the expo as I had hoped. This won't be an issue next year in Anaheim, thankfully. 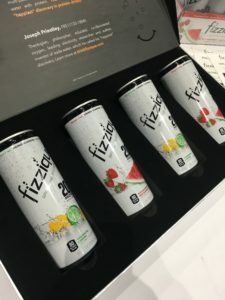 While not an official sponsor of BlogFest, Fizzique did include some product in our swag bags, and I know they have worked with Sweat Pink, so I went out of my way to find them at the Expo and see what they are all about. The description–sparkling water with whey protein–sounds weird and questionable, but the product is actually quite tasty. First, it's clear. (I had expected it to be milky-looking due to the whey protein.) It's only 80 calories, which is about halfway between a diet soda and a regular one. All of the calories come from the protein, as Fizzique has zero carbs. Fizzique is at the intersection of two very popular categories of consumer packaged goods: sparkling water and protein. The idea behind Fizzique is to curb hunger between meals by giving your body some protein but not many calories. (It is NOT a meal replacement drink.) 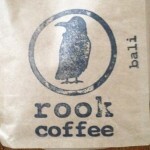 Each can also has 45 grams of caffeine, which is about the same as a cup of green tea. 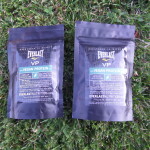 There are currently two flavors, Tropical Limon and Strawberry Watermelon. I tasted both, and I like them both. In a toss up, I'd pick Strawberry Watermelon. 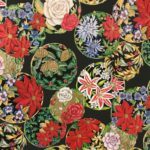 Fizzique currently has an offer on their website where you can get 10% off if you subscribe to their email list. Or you can order from Amazon (affiliate link, but if you've read this far you probably don't mind supporting the blog?) and it is eligible for Prime. There are two prizes for this giveaway: Snacks and Sips. Snacks. This prize features the brands that sponsored BlogFest, Be Better and Jimmy Bars…though I may just have to sneak a few more things in there to fill up the box, you know? Sips. 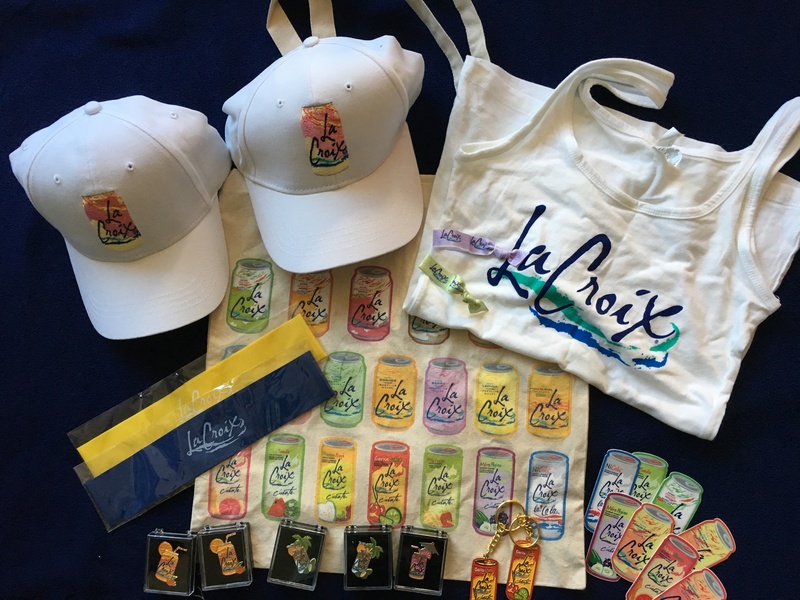 This prize features La Croix-themed items, because seriously, who doesn't love La Croix? Drink it straight, use it as a mixer, make it into a mocktail. There's enough swag here to share with your bestie, too. Enter using the widget below. But first, start by leaving a blog comment to tell me which prize you'd like to win! Two winners will be randomly selected, the first winner gets to choose their prize. Seriously, I am with you! 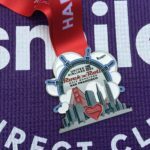 Run all the miles, eat all the snacks. I like the Be Better protein squares in Coconut Trail Mix. I would rather win snacks. Those are amazing! It’s like a candy bar, only not a candy bar, and I don’t need to stuff my face with a bunch of them. I would love sips. That is my key to loosing weight. I have to have something in my hand and if it is pop I like to drink it and everyone knows you cant lose weight when you are drinking pop. I like snacks that are healthy I have lost 11 pounds so far and more to go. 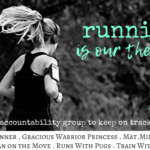 Thank you for the blog!! So true! The fizzy waters (and my Soda Stream) make it much easier to NOT be drinking something sugary. I crave that fizziness, and once I figured out it was the fizz (and not the actual thing–Pepsi, Diet Coke, whatever), it was much easier to ditch the soda habit. I’ve read that fake sugars, like in diet soda, can make you feel hungrier. I personally feel that way when I drink a big ol’ diet soda. 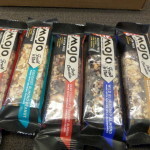 I like bars with fruits, oats and nuts the most I do my best to stay with the healthy snacks but tough battle at times. Right? This is part of why I try to keep my desk drawer stocked with healthy things. If I think I’m hungry, but I’m not interested in a healthy snack, I might just be bored. My favorite snack is popcorn. I’d rather win the snacks. Or the sips. Or either. Or both! My favorite snack is popcorn. If I win, I’d rather win snacks. Or sips. Or either. Or both! You’re like me–snacks! Sips! All the things!